One of life's great pleasures is a plate of homemade pasta with duck ragu' - it's everything winter comfort-food should be; nourishing, rich and warming. Far from being difficult or time-consuming, using duck breasts in place of whole duck shortens the cooking time and everything is ready in just over an hour-and-a-half. As with all recipes that are this simple, the secret lies in the careful sourcing of ingredients - ethically raised duck*; organic, free-range eggs; grassy, extra virgin olive oil; and the best tinned tomatoes from Naples. By keeping the skin on and cooking the duck breasts gently in a bath of flavourful stock they remain tender and moist. I find that the finished dish is fattier with whole duck, but if this is what you have, cut it into six pieces and cook until the meat is tender and falling off the bone. 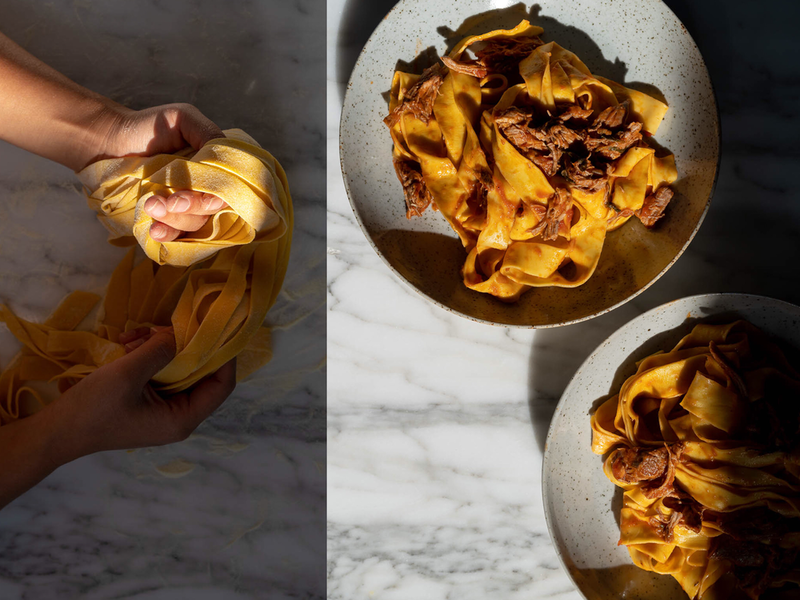 While nothing compares to making pasta with very fresh eggs from your own hens; if you happen have access to a few duck eggs, they make a beautiful, rich pasta that is perfect with this sauce. Potato gnocchi is also wonderful with duck ragu'. Senora Gonzalez is my friend Amanda's mum - and this is her paella. When she came to Australia from Madrid in 1973, she brought her seven paellera (paella pans) on the plane. They range in size from 2 to 75 serves, but when I suggested we make a small paella together, she scoffed at the idea of cooking anything that would feed fewer than 12. When I asked if I could make a little film of her cooking her paella, far from being secretive or shy, she smiled her broad, generous smile and told me she wants everyone to know how to make a proper paella! Recently my eight-year old nephew visited and I had to admire him; apparently since my parents brought home Violet and Harley (two hens despite one being dubiously named); he refuses to eat chicken. Because sometimes, particularly when it’s cold; I want to eat something comfortable, nostalgic even; without the fuss of anything overly challenging or new. And as much as I wish I felt wrong about eating chicken since we got our girls (six years ago now), I can’t think of anything better than a good, old-fashioned roast chook, served alongside a pile of root vegetables and always a jug of hot gravy. It’s a ridiculously easy, almost sacred Sunday meal and the most satisfying one pan dinner I can imagine.